The Island That Launched Millions of American Journeys! Back in the 1700s, it would be easy to overlook the small collection of sand in the middle of New York Harbor known as Kioshk Island. But over the years, the island would evolve and literally grow to serve as the cornerstone of over 12 million immigrant experiences. From 1892 to 1954, Ellis Island was home to the United States' first federal immigration station, processing the paperwork and inspecting the health of thousands of newcomers each day. Known as an "Island of Hope" for its promise of a new life, as well as an "Island of Tears" for those who couldn't move past its shores, Ellis Island is still an iconic symbol of our country's promise and history. Today, Ellis Island is part of the Statue of Liberty National Monument, with the center's main building serving as the Ellis Island National Museum of Immigration. The island still attracts millions from around the world -- only now the buildings house the images and stories of those who arrived on its shores, engaging and inspiring generations to come. Now, representing the state of New Jersey, this landmark has been immortalized as part of the United States Mint's America the Beautiful Quarters® Program -- and you can bring it home to your collection, struck in five ounces of stunning silver! ILLUSTRATIVE, INSPIRING DESIGN . . 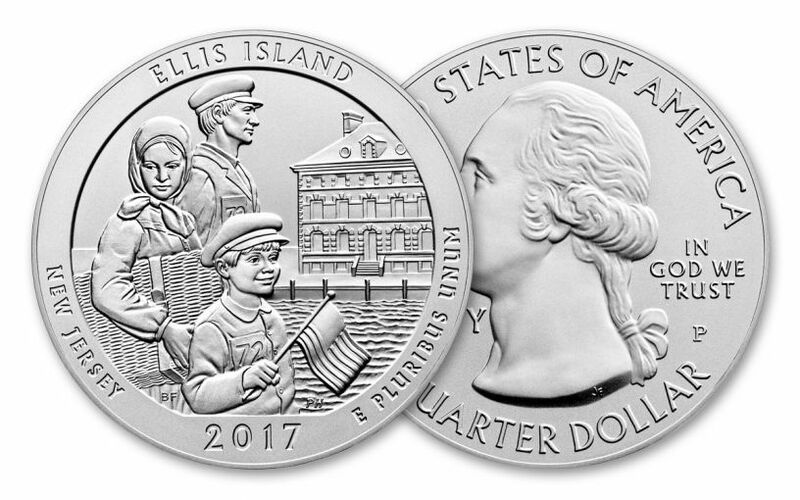 .-- Featuring the talents of designer Barbara Fox and sculptor Phebe Hemphill, this silver coin's reverse design captures the hope, uncertainty and promise of an immigrant family as they approach the island's main building. 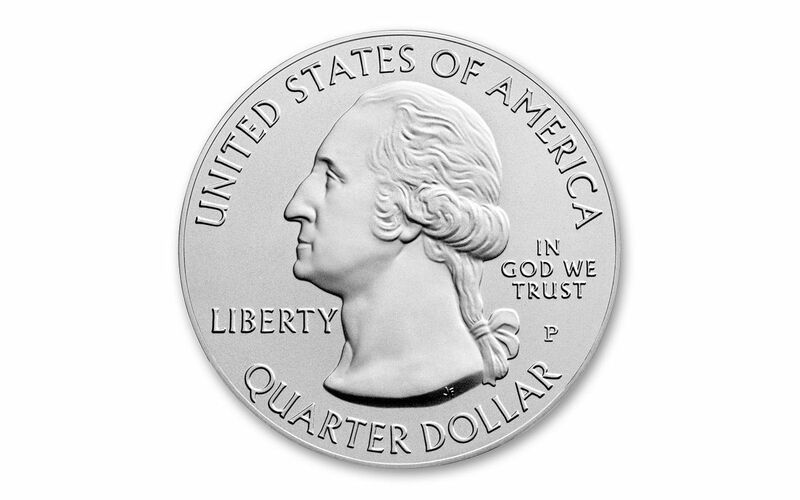 Flip the coin over, and you'll find John Flanagan's standard portrait of George Washington.
. . . STRUCK IN FIVE OUNCES OF SILVER!-- Struck in a weighty five ounces of 99.9% fine silver by the Philadelphia Mint, each coin has a massive diameter of three inches and thickness of over four millimeters, but still has a legal tender value of 25 cents! Incused edge lettering confirms that your coin is, indeed, ".999 fine silver 5.0 ounce." A SUPERB SATIN FINISH!-- Unlike its bullion brethren, this collector version of the 2017 5-oz Silver Ellis Island Coin sports a more matte satin finish. Not only that, but this specimen edition also features the Philadelphia Mint's "P" mintmark! A COLLECTORS' FAVORITE SERIES! -- This fourth America the Beautiful Quarter release of 2017 continues the popular series, first established in 2010 and still attracting new collectors to the fold! 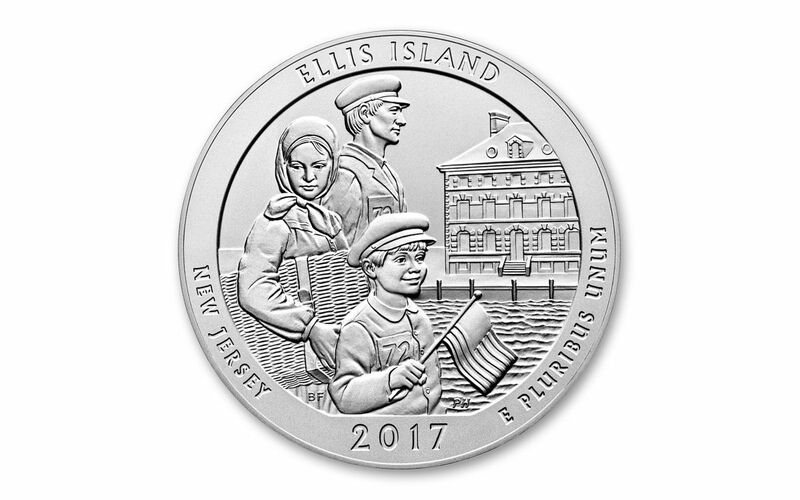 Whether you're a descendent of an Ellis Island newcomer, a fan of American history or a passionate America the Beautiful Quarters collector, this 2017 5-oz Silver Ellis Island Specimen Coin is both an ideal addition and a perfect gift. Just don't wait to order yours before this opportunity closes for good -- add it to your cart now!